HomeBrowse LibraryCongratulations to the 2018 SCORE Award Winners! Every year, we honor some of our remarkable, dedicated small business clients and their mentors for the SCORE Awards. We celebrate these small business owners, their achievements and impact to their communities. This year, we have an eclectic group of 11 small businesses that perfectly define the spirit of SCORE. In 2012, De Heaton was instrumental in restoring Corning Opera House Cultural Center to its original splendor. The goal was to create a facility for weddings, banquets, meetings and conventions. With help from SCORE webinars and her mentor, Sherry Bonelli, De Heaton became the COHCC executive director and learned how to increase their social media and website presence. The restoration and influx of traffic have allowed the COHCC to flourish. COHCC now provides the community with community theater, youth musicals, opry shows, conferences, trainings, vendor fairs, reunions and much more. After years of dealing with excessive sweating and exhausting the medical options available to them, Billy Thompson and Randy Choi decided to create Thompson Tee Inc., a line of t-shirts that trap excess sweat. Their SCORE mentors, John Pietro and Larry Tucker, helped them create their business model, move into digital marketing and focus on the core of their business. Since its inception, Thompson Tee Inc. has doubled every year and currently serves over 100,000 customers in 135 countries. After over 25 years spent working with non-profits in Africa, Rhoi Wangila recognized that middle-class African consumers were looking for quality American products. NAVA provides support to African small businesses and institutions, contracts with U.S. institutions, businesses and federal agencies, and sells African products in the United States. SCORE mentors Fred Elam and Karen Williams helped her with government applications and business structure and offered valuable feedback to improve responses. After attending the “Bug Buffet” event at Montana State University, Kathleen and James Rolin nursed the idea of starting their own cricket farm. Within their first year of business, they received over $100,000 in grants and awards. Since then, they have released consumer products, developed technology to simplify cricket farming, and started the first network of cricket farmers. Their mentor, Rick Sanders, helped them with their business plan, media coverage, grants and community outreach. After years of teaching in the public-school system, Brooke Bauer left her job to pursue CraniaLogix, an after-school program that teaches higher-level thinking skills, collaboration, creative thinking and enjoyment in learning. SCORE mentors Tim Carnell and Terry Toomey helped answer Brooke’s questions about bookkeeping, financial planning and marketing. They’re now focusing on scaling the business for franchising. Brit Harger grew up in a family where her parents struggled to find caring therapy options for her siblings with special needs. In 2013, Brit and Adrianne Smith founded Creative Behavior Solutions, an Applied Behavior Analysis clinic that improves the social, academic and life skills of toddlers, adolescents and teens with developmental disabilities. Their SCORE mentors, Mats Bengtson and Keith Knowles, have helped them think like businesspeople, network with the right people and grow their business. Working with SCORE has helped them double their business each year, expand from two to 25 employees and move into a 5,000 square-foot clinic. After spending years watching Chopped on the Food Network, Maddie Purcell realized she wanted to run her own company and decided to create Fyood. The company hosts local Chopped competitions where teams have to create a sweet and savory dish from a fully-stocked pantry and a mystery basket they’re given. Fyood is designed for collaboration, creativity and laughter. Maddie’s SCORE mentors, Nancy J. Strojny, Jewel Church and Jamieson Webking, have helped her with her Kickstarter campaign, selling strategies, networking and financing. Despite always having a passion for insects, it took Drew Burnett quite a few years to realize honeybees were his calling. He began creating and selling ethical honey and beeswax personal care items. His mentors, Margo Weitekamp, John Oliva and Alan Mayer, helped him break into contract manufacturing, create a business plan and stay on top of his finances. Drew was even connected to a co-mentor who has over 30 years of experience in the skincare industry. Drew’s Honeybees has been growing steadily and has been recognized by several large grocery retailers! In 2010, Ethan and Kate Zuckerman founded Blue Ridge Bucha, a Blue Ridge Mountain inspired kombucha company. The tangy and sweet kombucha is certified organic, sustainable and made from pure Blue Ridge Mountain water. Ethan and Kate connected with their mentor, Steve Cooper, and have gained valuable support and advice while learning how to better handle their cash flow. They currently have over 80 locations, and their mentor said he wouldn’t be surprised if they’re one of the largest kombucha companies on the East Coast in the next 5-10 years. Lauren Hughey, Kate Compton Barr, and Amber Kroeker decided to provide a safe, stable and nurturing environment for infants to help reduce injury. The three of them began thinking of ideas and came up with an eco-friendly, bassinet designed to reduce the risk of SIDS. Their mentor, Jon Stuart, has helped them in all aspects of their business, including networking with other experts who have helped them tremendously. With 2017—their first full year in business—behind them, they’ve managed to secure significant wholesale orders and sharpen their direct-to-consumer marketing efforts. They hope to continue growing and are in the process of working with a company that has over 23,000 locations worldwide. Over the years, Jamie Kothe has transitioned her business from a school for film production and creative visual effects to a school that employs, trains and empowers individuals in the digital media, digital graphics and technology fields. DSDT offers Detroit locals the chance to learn technology skills so they can benefit from the tech industry rather than be displaced by it. Because of this education, Jamie projects 94% of her students will find jobs or opportunities for further study in Detroit within six months of graduation. Since working with mentors David Broner, Dan Brophy and Kevin Kelly on sales, finances and organizational needs in training, the school has tripled its revenues. 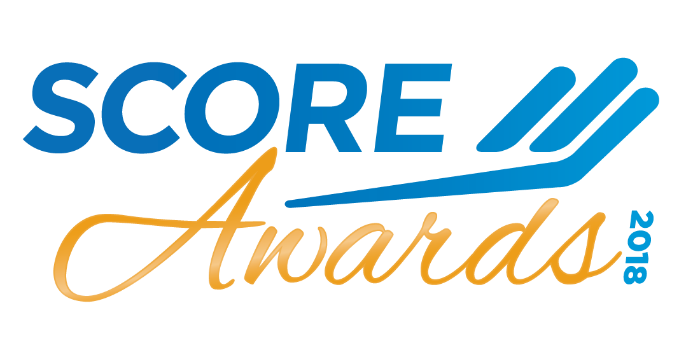 Learn more about all our SCORE Award winners. Are you looking for ways to improve your small business? Reach out to SCORE today to find a mentor who can help you along the way. Maybe you can win a SCORE Award too!